This year the Institute for Latin American Studies at the School of Advanced Study, University of London, have situated global issues (including migration) at the top of their agenda for debate. They invited Dr. Ana Margheritis to co-organize an interdisciplinary conference with broad aims. Please find more details in the call for papers and link to webpage below. This one-day ILAS conference at the University of London will present and debate new research on the multiple ways and means of addressing and managing global migration flows between Latin America and Europe. The conference will move beyond area studies by focusing on two world regions historically linked by human mobility and cultural exchange but now grappling with significant demographic changes and new migration trends. These changes and trends include the reversal of flows, the greater heterogeneity of migrant groups, the pull of women leaders in family migration projects, the concentration of newcomers in non-traditional destinations, the intensification of dual or multiple engagements in the country of origin and residence, and the development of new forms of citizenship beyond borders. The aim of the conference is to assess how and to what extent state and non-state actors in both Latin America and Europe are coping with and capitalizing upon the complex and creative implications of these new trends. By Meg Sherman, a student of Modern History and Politics at University of Southampton. The global movement to divest from fossil fuels is a clear-thinking, progressive choice for action on climate change. This Changes Everything: Capitalism VS The Climate, a newly published volume by Naomi Klein, provides an invaluable history of environmental and economic injustices and should be required reading for anyone interested in the divestment movement. The truth on climate change is hard to identify in a world where business is powerfully invested in misinformation. But under the smog of denialism the effects of human-made global warming (via carbon emissions) are already being wrought in real, violent ways upon the planet: ways of life are being extinguished; low-lying pacific islands look set to be swallowed by the sea; global temperatures melt previous records with alarming alacrity, and extreme weather events displacing large populations are fast becoming the norm. Our generation lives throughout the endgame of industrial civilization, a time when humanity urgently needs new, compelling narratives about potential transformations in society, economics and politics. Incisive, compelling and relevant as its predecessors, Capitalism VS The Climate appears as a stray flicker of hope, imploring a thoughtful resistance to predatory capitalism and envisioning a real place for a climate movement with redistributive justice at its’ core. Following in the path of No Logo and Shock Doctrine, Klein’s latest volume deepens her earlier work exposing the disastrous underbelly of neoliberal globalization. The crux of her argument is that the environmental crisis is itself a consequence of the systematic desolation of the global commons, increasingly privatized and deregulated by centralized trading regimes, dominated by the richer industrialized nations, questing for more control of planetary resources. Shock Doctrine railed against the callousness of structural adjustment regimes which deprived nascent economies in the global south of their health, wealth and stability in order to serve the narrow interests and myopic greed of corporations and profiteers, that is to say, the agenda of the 1%. And in Capitalism VS The Climate Klein, using the aftermath of hurricane Katrina by way of example as to how reconstruction efforts can be hijacked and stymied, argues that global warming itself will be hoisted to the engine of the shock doctrine insofar as business competes to advantage from mounting crises without advancing help, solutions, assistance or attempts to mitigate and alleviate the accruing damage. Instead they use crises cynically as a platform for further deregulation and privatization, undermining public unity and collective solidarity. This is disaster capitalism laid bare: a lethal obstacle to public health and environmental sustainability. Major economies founded on the extraction of fossil fuels and emission of greenhouse gases are the major crisis culprits, stoking inequalities. Key stakeholder groups with historically the least restricted access to resources deriving from this foundation are called upon to amend their high-consumption lifestyles, to rediscover the real need for economic justice, or condemn global citizens to further disaster. When it comes to climate change prominent politicians and business leaders argue that we can overcome it by investing more faith in technological and market-based solutions, perpetuating the idea that we don’t need wholesale social and economic reform to underwrite the transition to a low-carbon future. Klein on the other paw argues that a deregulated system which creates the widespread market failure of climate change has obviously outlived its utility, and she argues for more support for research directed at renewable energies, as a pre-requisite for solving issues of public health and the environment. She is astute when she argues that if you take the warnings of modern climate science to their logical conclusion then we ought to have democratically control over public utilities so that they are governed less recklessly. A well-known truism states that madness is doing the same thing repeatedly and expecting different results. Einstein put it this way: We cannot solve our problems with the same thinking we used when we created them.” How, then, can we rely on plutocratic capitalism to solve a problem it created and support the long term needs of life on Earth? Global forecasts predict another unassailable reality aside climate change, that fledgling economies like Brazil, Russia, India and China, tailed by developing LEDCS, will together surpass the activity of the traditional MEDCs and G7 by the middle of this century. The total energy demanded to support those transitions is huge. And two imperatives are to meet that demand and to do it whilst reducing overall greenhouse gas emissions. Concurrently. An immense challenge. It is clear that climate change is an urgent global issue and getting good policy and functional alternatives on the go is crucial as only this will form the basis for societies and industries to reverse the very damaging practices inherent in current methods of production, to respect the balance of nature, and ensure we put a stop to pollution everywhere to protect the shared lands which sustain life on the planet. And the narrative in Capitalism VS The Climate is driven by a heartfelt wish to open people’s eyes to the collective power we have to create new visions and strategies, real options and choices for progressive, radical change in a future which runs fugitive from the totalizing, destructive ambitions of corporate capitalism. By Pia Riggirozzi. Pia Riggirozzi is Associate Professor in Global Politics at the University of Southampton (@PRiggirozzi, Academia.edu). You can find more posts by Pia here. Argentina’s open presidential primary is over, and the stage is now set for the election in October. With the current president, Cristina Fernández de Kirchner, constitutionally barred from running again, the autumn poll looks set to be a fight between Argentina’s two main political coalitions. On the left is Daniel Scioli, the current governor of Buenos Aires province, who leads the official Peronist party Front for Victory. He is Cristina de Kirchner’s candidate of choice, though has stayed shy of taking on an explicitly Kirchnerist political identity. On the right is the current mayor of Buenos Aires, Mauricio Macri; he heads a coalition of strange bedfellows called Cambiemos (Let’s Change), which comprises Macri’s conservative Republican Proposal party, social democrats, and the Radical Civic Union. The primary system pits all the parties’ candidates against each other in one poll to determine who runs in the general election. Scioli and the Front for Victory got the biggest share with more than 38%. That sets him up well for the elections in October, bodes well for the nation’s verdict on the highly contentious and deeply personalised Kirchnerist legacy. When Fernández de Kirchner’s term ends in December 2015, she and her late husband and predecessor Néstor Kirchner, who ruled from 2003-7, will have enjoyed the longest unbroken presidential tenure since Argentina became a democracy, in the course of which they left a profound mark on their country. As Juan and Eva Peron did before them, the Kirchners have managed to establish a political style that will bear their name long after Cristina finally leaves office. 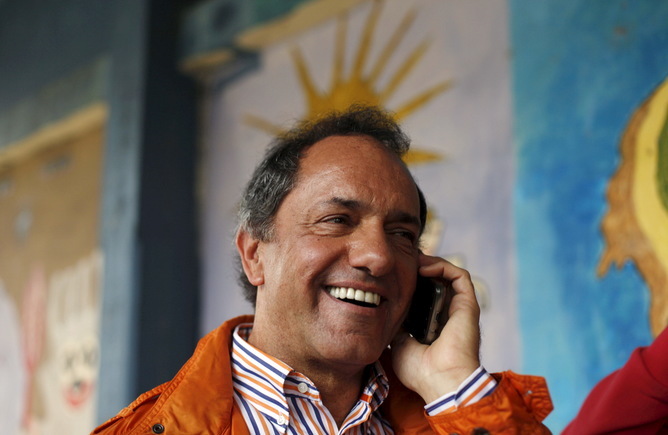 Governor Scioli: Cristina’s best hope? The political project now known as Kirchnerismo (Kirchnerism) is undoubtedly very divisive. For some, it stands for a return (at least in aspiration) to economic growth, prosperity, and the expansion of citizenship rights, all led by the state. For others, it represents a corrupt quasi-authoritarianism, combined with cynical populism and meddlesome state intervention. Nonetheless, the expansion of rights and welfare provision under the Kirchners has been so widely welcomed in Argentina that none of this election’s contenders dares to challenge it. And with such a strong consensus on a big tranche of Kirchner-era social policy, the campaign might fast descend into a game of character mudslinging. That’s partly a factor of the weakness of the candidates themselves. De Kirchner has failed to cultivate a strong heir, and the opposition isn’t faring much better. Cambiemos, for its part, has not developed a convincing and comprehensive political platform to take Argentina in a new direction. All it seems able to do is mount fierce attacks on the personal and political style of Fernández de Kirchner and her entourage – something the last few years have hardly made difficult. Throughout their 12 years in office, the Kirchners have been dogged by accusations of corruption, which have badly eroded Fernández de Kirchner’s popularity and legitimacy. Things have only gotten worse in recent years. Discontent and distrust have grown under Kirchnerist statism, with its apparent reluctance to protect private property, and alleged propensity to favour government cronies with subsidies and contracts. Conflicts with the media and opposition media groups have also led Argentine investigative reporter Jorge Lanata to investigate a possible network of international bank accounts and unaccounted wealth connected with the state. Things reached a fever pitch when prosecutor Alberto Nisman was found dead in his apartment on January 18 2015. His body was discovered just hours before a judicial inquiry was expecting to examine claims that Fernández de Kirchner and her foreign minister, Héctor Timerman, tried to cover up Iran’s role in the country’s deadliest ever terrorist attack. Nisman’s case against Fernández de Kirchner and Timerman was dismissed on February 2, but it dealt a heavy blow to the government’s credibility and authority. Adding to the twilight atmosphere is a seriously beleagured economy. Some pessimists are even predicting collapse, a forecast born of creeping inflation, slow to non-existent growth, a serious dependence on commodities markets, and a deeply destructive default. Detractors of Fernández de Kirchner, and Kirchnerism, want Argentina to save itself from true disaster with a return to capital markets, even becoming a major regional economic power again if the right economic policies are implemented and sustained. Such accommodation with global neoliberalism would mark the true end of the Kirchnerist project. Latin American politics expert Steven Levitsky argued that we might in fact be facing “the end of the left in Latin America”. The commodity boom has all but ended, and many of the leftist movements that rode it to power in Argentina, Brazil, Chile and Uruguay are running out of steam after too many years in power. But what this analysis misses is the depth of the left’s legacy – a plethora of policies for social inclusion, citizenship and rights that has left a deep imprint on the continent. Kirchner-era Argentina, for its part, has taken bold steps to widen its social safety net and citizenship rights. Targeted cash transfer programmes, which were initially short-term, were extended by the plan Argentina Trabaja, supporting co-operative enterprises in poor neighbourhoods. Cristina’s government also introduced a targeted programme for children, the Universal Child Benefit (Asignación Universal por Hijo or AUH). It’s not the country’s first child benefit scheme, but it covers the population on an unprecedented scale. The AUH provides around 200 Argentine pesos (US$50) a month to nearly 4m children and families, and 80% of Argentina’s children now receive some form of child benefit. For the first time, the government is extending welfare programmes directly to children and to workers who are not unionised. In fact, most beneficiaries will be self-employed or in the informal economy – groups that were particularly active in the protests of 2001. The Fernández de Kirchner government also introduced a “reasonable” minimum wage for non-unionised workers (including domestic workers) in 2008, and has put pressure on private health companies to extend their coverage and reduce their charges. An anti-poverty strategy has brought poverty down to around 25% from more than 50% in the wake the 2001-02 economic crisis. In this scenario, it is not surprising that the poor voters who have benefited from state largesse over the past eight years remain loyal to the Kirchnerist project. 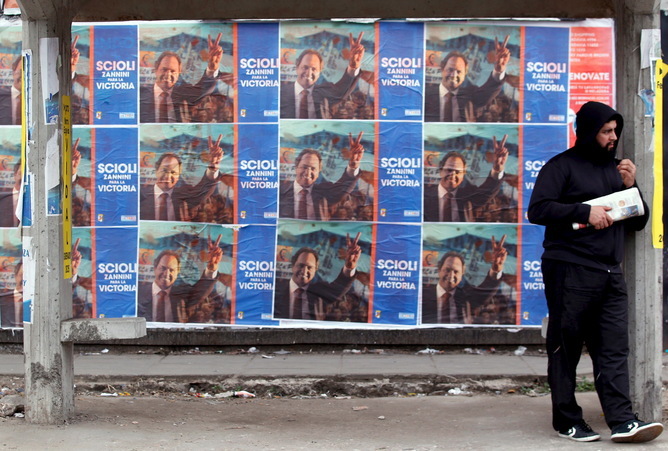 This explains why Scioli is riding high, for now at least. His ascendance is a sign that despite all the problems they and their country have faced, the Kirchners have managed to construct a legacy of inclusion and social rights that may yet endure. An earlier version of this piece first appeared at Latin America Goes Global. By bringing together the 12 South American countries, the Union of South American Nations (UNASUR) is advancing an effective rights agenda in access to medicines and attention to developing country demands. In an open letter to the heads of government of all Trans-Pacific Partnership Agreement (TPP) negotiating countries, Médecins Sans Frontières / Doctors Without Borders, expressed serious concerns over provisions under TTP and bilateral trade negotiation that threaten to restrict access to affordable medicines for millions of people in low- and middle-income countries, and hence their right to health as expressed by the UN Committee on Economic, Social and Cultural Rights in numerous international declarations. This is the case for instance of the EU-Andean Trade Agreement on Access to Medicines in countries such as Peru and Colombia. It is estimated that the introduction of the measures on patent protection would lead to an increase of 459 million USD in Peru’s total pharmaceutical expenditure by 2025; and of 756 million USD in Colombia’s total pharmaceutical expenditure, leading to a significant decrease in consumption of life saving medicines. Facing this scenario it is not surprising that attention to access to medicines as an issue of rights is increasing. In 2014, a joint commission from the medical journal The Lancet and the University of Oslo published policy report in which it cited the imbalance of political power between nations as a major cause of health care inequality across the world. According to the report, disparities in health are not just linked to poverty but also to the unequal distribution of material and knowledge resources across nations and the capacity to influence global governance. While there have been tremendous global advances in expanding civil liberties—through international laws and practice—much of the normative infrastructure and policy to support rights was crafted and is still shaped by the interests of the developed north. Even in the morality of rights—civil, political, social, and economic—power rules. International frameworks pushing for universal human rights in relation to social and economic development are still filtered through institutions such as the UN, the Bretton Woods institutions (the International Monetary Fund and the World Bank) and northern donor organizations. These are conservative institutions that have been slow to embrace broader economic and social rights, including health. Today, though, in the new rash of regional organizations, can the Global South reset the norms and rework global (health) governance in support of rights and social justice goals? While the Global South has struggled to advance broader economic and social rights in the development agenda, the Union of South American Nations (UNASUR) has focused on a significant concern for its regional members: the right to health. In the area of health, developing countries have historically been disadvantaged in the access to medicines and influence in setting the global health agenda—a result of they weaker status relative to business and the developed north. Developing countries’ access to medicines has been hampered by trade negotiations that reinforce existing intellectual property standing and international institutions and laws governing intellectual property rights that favor business over patients in the developing world. In South America, the high cost of medicine and the lack of alternatives to existing drugs is particularly acute. Medicines not only define who lives and who dies but also why (and how) countries in the south. According to the Secretary General of UNASUR, Ernesto Samper, almost 30 percent of the total public and private health care in South America is spent on medicine. UNASUR picked up this challenge, creating the UNASUR Health Council—one of the first councils created by the new regional group—and forming an alliance with the regional health think tank, the South American Institute of Health Governance (Instituto Sudamericano de Gobierno en Salud, ISAGS), in Rio de Janeiro, Brazil. The new alliance is in a far strong position to pursue South America’s agenda in medicine than the traditional Washington, DC-based Pan-American Health Organization (PAHO) UNASUR/ISAGS is in a better position to deliver effective health governance than PAHO, which is focused on “health coverage” instead of UNASUR/ISAGS’ more ambitious agenda of “universal access to health.” These two approaches represent different ways of addressing how health care reaches societies, and ultimately speak of different conceptions of entitlement and equality. ISAGS focus has been on the broader idea of strengthening health governance capacity, advocating the right to health and supporting policymaking and policy reforms towards the universalization of health care. In this capacity it has trained policy-makers and practitioners by setting up UNASUR-sponsored public health schools in Bolivia, Guyana, Peru and Uruguay, and assisted in the creation of a UNASUR network of public health schools. ISAGS has also provided support directly to ministries of health in Guyana and Paraguay on primary care and the preparation of clinical protocols, and has supported reforms aimed to move towards universalization of health sector provision in Bolivia, Colombia and Peru. ISAGS is involved in the diffusion of information on combating HIV/AIDS, influenza and dengue fever across the region, and has developed mapping techniques to coordinate shared policies for the production of some key medicines. Policy advances of this sort—concrete, modest, focused and cheap to deliver taken in a relatively short timeframe and below the radar of political commentary—are unusual in previous efforts in at regionalism in South America. And they stand as evidence of UNASUR’s focused, grounded approach. ISAGS has begun to scale up its level of activity on behalf of UNASUR, once again with relatively little attendant publicity. ISAGS has been quietly targeting global health governance forums and is trying to establish a joint bargaining position for South American negotiators vis-à-vis pharmaceutical companies and in the World Health Organization (WHO). ISAGS now holds meetings prior to each annual gathering of the WHO, so that UNASUR member states coordinate their actions at the WHO. It’s an approach that both UNASUR and ISAGS are now using to speak out more widely on behalf of other developing countries. As part of this campaign, UNASUR has also begun to take action on access to medicines. The strategy centers on coordinating active resistance to the dominance of pharmaceutical companies under a motto that links regional health diplomacy with sovereignty. For instance, UNASUR is setting up a “Medicine Price Bank”, a computerized database revealing the prices paid by UNASUR countries for drug purchases. By making the information public and comparative, UNASUR is seeking to provide policymakers and health authorities information to strengthen the position of member states in purchases of medicines vis-à-vis pharmaceutical companies. Likewise, UNASUR’s Health Council has approved a project for the mapping regional pharmaceutical capacities in 2012, to coordinate common policies among member states for production of medicines. Within the WHO, UNASUR has pressed to change international norms regarding the combat of counterfeit medical products. Until recently that effort was spearheaded by the International Medical Products Anti-Counterfeiting Taskforce (IMPACT), an agency led by big pharma and the International Criminal Police Organization (Interpol) and funded by developed countries engaged in intellectual property rights enforcement. At the 63rd World Health Assembly in 2010, UNASUR successfully proposed that an intergovernmental group replaced IMPACT to act on, and prevent, counterfeiting of medical products. This resolution was approved at the 65th World Health Assembly in May 2012. In the course of the meeting, UNASUR also lobbied for opening negotiations for a binding agreement on financial support and research to meet the pharmaceutical needs of developing countries, and issue that was resumed at the 67th WHO meeting last May. More recently, a key policy has been agreed in support of the establishment of a fund to negotiate centralized purchases of the Hepatitis C virus treatments. This proposal, agreed by UNASUR Health Council in July 2015, will represent a milestone in the region in savings through price negotiation on an innovative and expensive medicine. It could also create incentives for the industry as centralized purchases could be a more conciliatory route towards medicine price reduction rather than the practice of compulsory licenses and direct government price cuts in the region. The presence of UNASUR in this type of health diplomacy, and its coordinated efforts to redefine rules of participation and representation in the governing of global health, demonstrate that there is a new logic and momentum in regional integration and regional policy-making in Latin America. These actions create new spaces for policy coordination and collective action. In the all-important case of health rights, UNASUR—and other regional institutions too—can become an opportunity for practitioners, academics and policy makers to collaborate and network in support of better access to healthcare, medicines and policy-making.